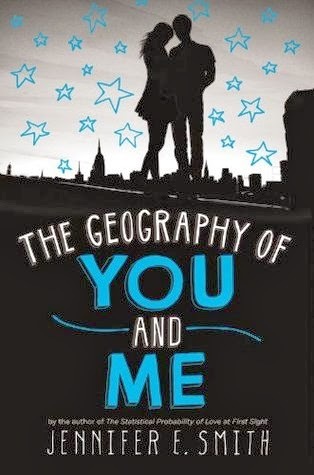 I've been wanting to read a Jennifer E. Smith book for some time now, as I've heard she writes really cute contemporaries and I am all about those! While this was a cute read, I found it just didn't quite have that special something I was looking for. Pacing: I felt the pacing was okay. Smith is a very descriptive author and I felt it was a bit overkill for my tastes. I also felt the overall action of the plot was lacking. While I enjoyed the description to an extent, I just didn't feel a good balance between the two. Storyline: I thought the premise was a cute one- two people meeting under a rather unique circumstance and spending time together, only to be separated shortly after and having to overcome that obstacle. I felt the blurb of this was a bit misleading. I was waiting for this epic romance that would defy time and space and I just didn't get that. I thought Owen and Lucy would have an actual relationship and spend their time writing back and forth and actually pining for one another. Don't get me wrong- I like that Smith went in a realistic direction in terms of both of them meeting other people, but I don't feel Owen and Lucy's relationship was emphasized nearly enough. In fact, they really seem more like two passing ships in the night, than two people who shared a connection together at one point in time. Owen is resistant to responding back to her via email, which I didn't really understand, and only sends her postcards, which, while charming, was frustrating because they were usually silly inside jokes and didn't have any depth to them. I think one of my problems was that I went into this book looking for a cute romance and ended up getting more realism than I had planned. Characters: I didn't really find myself connecting to these characters to be honest. I felt bad for Lucy, as she essentially takes care of herself at 16. Her brothers are off at college and her parents gallivant around the world, leaving her at home. This bothers her, as she would also like to go see these places, and she finds herself lonely a lot of the time. She isn't a social butterfly and doesn't have very many friends of her own. Spending one night with Owen and sharing her love of NYC with him really made her feel special and definitely not so lonely. Her feelings for Owen seemed like they ran a little deeper than his for her, as he would cross her mind more often while she was away. Where Lucy loves the city, Owen does not. He is having a hard time adjusting to his new life there and he and his father are still grieving over the loss of his mother. While Lucy moves away internationally, Owen and his father jump in the car and travel across the country trying to find their place. Sadly, each place doesn't seem to last very long before they're back on the road again. I did have a hard time understanding why Lucy and Owen's next meeting was so awkward when they were at the restaurant in San Francisco. I get they were nervous, but wow they took it to a whole other level. They were much more comfortable outside, where I guess they didn't feel restrained in any way? Just the freedom of being outdoors in a vast world makes the conversation flow, maybe? My biggest issue I think was that I just didn't really get Lucy and Owen's relationship. I didn't see them develop into friends and when they met up again, it still felt distant and off. It wasn't until the end where I really started to see their feelings evolve and mature and that their 'relationship' made more sense. Final Thoughts: I did really like the whole 'home isn't necessarily a place' aspect the book had. Lucy and Owen both realize that it's not necessarily about the place they end up, but who is there waiting. Overall, it was cute, but I just needed more. I had a hard time believing in their relationship, because I didn't feel they really had one for most of the story. They shared a connection one night and then went their own ways, only thinking of one another occasionally. The ending was sweet, so fans of Jennifer's writing style and light-hearted nature will be very pleased. Thanks Danielle. I am such a romantic, so I was really disappointed by the lack thereof! I saw the mixed reviews and held my breath hoping they were wrong... not so much. I loved Statistical Probability so much. But when I read This is What Happy Feels Like, my thoughts are very similar to yours with this book. Sorry GoYaM didn't win you over. I'm glad you liked SPOLAFS! I have that one too, and I'm glad I know TIWHFL has the same vibe as this one, because I probably won't read it. Great review! Jennifer E. Smith books are always a hit or miss with me. I liked Love At First Sight, but I didn't really like the second one at all. So, I don't know if I'm going to read this one or not. I've been seeing some good reviews and some bad reviews for it. So, if I do want to read it I think I would just get it from the library. This sounds like a kind of disapointing read. Never heard about Jennifer E. Smith before. I will check her books out sometime. Great review! I've been wanting to read a Smith book for awhile, so I was really bummed this one didn't have that spark I was looking for. Try The Statistical Probability of Love at First Sight. I've heard that's the one to get. Oh poo. You know, I've heard many others complain about the same thing in her books, they are good but missing a spark. I adored her book The Stat. Prob... (I won't spell it out anymore!) though. I've been excited for her newer ones but the reviews have gave me a bit of pause. I hope to read them still, someday though. Awwwwww. Man. I am glad to hear everyone seems to like her first though. I will try that one next by her. I agree Brandee- usually with that much detail, you're bound to connect. Sadly, it was detailed character-wise but location-wise. And that just bothered me. Hmm.. I see the similarities between our thoughts on her books. I'd probably dislike this one too. >.< I dislike too much detail too. WORDY MUCH? Yes. I laughed when I read your review because I was like dude. I just wrote that. Hahaha. I'm glad we're both on the same ship for this one.